Michael Sweet is the Singer/Guitarist for the band Stryper. The band was known for their ability to deliver the message of Jesus Christ inside Hard Rock music and had a string of hit records in the “Big Metal Eighties” and were a staple on the MTV channel back during this original heyday. After several years of absence from the public eye the band reunited and toured once again in support of their Greatest Hits package “7: The Best Of Stryper”. From this short tour a live album was recorded and released entitled “7 Weeks Live In America”. Around the time of the release I had the chance to speak with Michael on the telephone. We discussed life, music, Stryper and his solo efforts. Below is the transcription of this conversation. KP – Hello Michael how are you man? MS – Hey how you doing, I am fine and just getting ready for the game tonight you know. King Diamond……..need I say more? King Diamond is truly the Master Of Terror when it comes to Heavy Metal music. 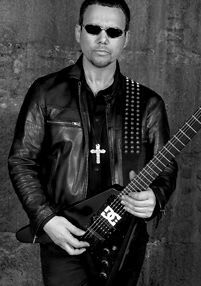 The man is a legend in Metal and not only for his work with Mercyful Fate but also for the prolific solo career which he embarked on afterward. For years he has been weaving tales of despair and intrigue and like the mere mortals we are, we follow him into the Darkness on a continual basis. I had the sinister pleasure of speaking to King Diamond via the telephone about his recent release of “Deadly Lullaby’s – Live” and whatever else came to mind. Here is a transcription of that conversation. KP – Great man, I totally expected a different voice on the phone, you know something a little more sinister. King Diamond – (changes his tone dramatically) Oh you mean like thisssss. Jon Schaffer has been a busy man for a long time. Most noted for his excellence in Heavy Metal as the Founder of Iced Earth, the guitarist has just completed the DVD “Gettysburg” which is a great companion to the CD “The Glorious Burden”. This CD has received a large amount of critical acclaim and features Tim Owens, from Judas Priest as Vocalist. In addition to this, Jon has finished the latest epic from Demons & Wizards, a Power Metal project with Hansi Kursch of Blind Guardian. Thanks to SPV Records I was able to sit down with Jon and discuss these and other matters of Metal. Below is the transcription of our conversation. KP – Jon it’s a great honor to sit with you and cover a few topics today be they Iced Earth or Demons & Wizards and some other stuff that’s on your mind. Let me start it all by asking how your health has been these days, especially your back as we know you had all that stuff going on with the surgery and all. SCHAFFER – Yeah It’s better than it had been in awhile in fact I guess when we were touring which was the wrapping up of the first leg of the “Glorious Burden” tour I was really suffering and by the end of the American Shows and doing the European Festival that we did it was really bad so I did have another surgery back in November of 2004 and I have had a lot of physical therapy and I think we are on the road to recovery here. It’s just it’s a long process and it’s (pauses) one thing to say it’s not that performing on stage makes it bad but it’s everything you have to do to perform onstage makes it bad . You know, traveling in a bus and bouncing around all night in a bunk and it’s not very restful. It never is when you are on tour doing that kind of stuff so you know that’s the problem is that this stuff always seems to inflame it when we go on tour and it makes it harder. But I think what I’m doing now and the kind of therapy that I am doing is the right thing and this all is obviously not related to my neck. That was a different problem from when I injured it back in 1996 back in Berlin and I had surgery in 2000. That actually has been doing really well and I’ve been doing pretty well with that. The low-back thing started a few years ago and it has just gotten progressively towards a pretty serious problem. Yet it seems like we’re on the right track. I’ve had a couple of months here where I’m in more comfortable than I have been in a long time and that’s a good thing. So we’ll see I just have to keep up the therapy. Guitarist Hank Shermann has long been a powerful creative force in Heavy Metal music. For years he combined efforts with King Diamond in Mercyful Fate and brought a sense of horror and evil to the front for Metal fans worldwide. Now, working with long time collaborator Michael Denner he has formed Force Of Evil. This no nonsense act is sure to please all fans of his work. Currently their release “Black Empire” (the second CD by the group) is receiving critical acclaim and a tour is being discussed. Hank took the time to answer a number of questions and we present them to you now. PIERCINGMETAL: Hank it is great to get the chance to talk to you about your newest band “Force Of Evil”. The first CD was a very exciting and heavy piece of music. Now with “Black Empire” being released tell me about the response you have been getting from the followers you have had over the years. HANK SHERMANN: Everyone seems to “dig” the new piece of music, which of course makes everyone in the proud. We always do our best at the moment of recording, so positive feedback is a nice reward. 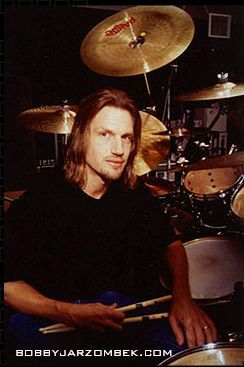 Bobby Jarzombek. His name is synonomous with powerful drumming. It was by listening to Riot that I first heard his playing and was totally blown away. Yet my attention was really put on alarm when he joined Rob Halford’s band and recorded and toured with them. From there, he joined Iced Earth filling in quickly for the departed member Richard Christy and is now working on PainMuseum, a release from Demons and Wizards as well as a new Halford CD. When you add to this his drumming DVD you will not believe that he actually had time to answer these interview questions. Yet, he proves how ambidexterous he can be for his supporters. Enjoy these words from his mind directly. PiercingMetal – Hey Bobby, thanks for taking the time to do this, as I know you are a very busy guy these days. For starters let me congratulate you on the position in Iced Earth as well as the new release you have with “Metal” Mike Chlasiak, and Painmuseum entitled “Metal For Life”. Let’s get started. Bobby Jarzombek – Cool, let’s do it. PiercingMetal – I have to say how impressed I was with how quickly you jumped into the Iced Earth drum throne. Please tell us about how you handled the learning of the tunes and the quick need to perform in a live setting. Bobby Jarzombek – After Richard recommended me for the gig, I had a couple conversations with Jon (Schaffer) about the songs, click tracks, etc.. They sent me 2 sets/versions of CDs. The first set of CDs were the songs as they appeared on the IE CDs. The 2nd set of CDs were rough mixes of what we’re listening to in our in-ear monitors while we’re playing the songs on stage, including the click track, orchestration, cannons, marching percussion, etc.. Pretty much what the audience hears also – except for the click track. These CDs were very important because after I learned the songs I needed to practice with the click track CDs to listen for the cues, count offs, etc.. After talking with the rest of the guys, I found it surprising that everyone had the click pretty loud in their ears, including Tim. He loved it. During certain sections (of the songs) without drums, he found it much easier to sing in perfect time with the click going.